Two weekends ago I came down with the flu. I worked the week after but was tired all week and what happened last weekend? Flu ... again! Not this weekend, though. I'm feeling good and it's time to do another beer of the week! This week I'm doing a beer from Hop City Brewing in Brampton. 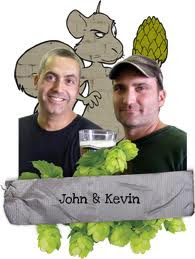 It was almost 2 years ago that Teena and I were at a launch party for Hop City's Mr Huff Pilsner (which I quite enjoyed) and had a chance to meet John and Kevin, the company's 2 brewers. They were nice guys! The company opened in 2009 as a subsidiary of Moosehead Brewery but acts totally independent of the parent brewery, making its own decisions. The do have Moosehead's massive distribution chain to look after that area and I imagine some of their marketing, although that is something I do not know. When I saw Big Mouth Pale Ale, I figured it was a brand new beer they had brought to market. The last I heard they did a pilsner, a lager, a wheat beer and one ale called Happy Hour. Turns out this is the same beer as the Happy hour. Why? It is explained here on their website. A beer with two names? Complicated, we know. Sometimes certain names aren’t technically allowed in some places so we’ve had to make some changes. Only to the name though. Sometimes it’s Happy Hour, other times it’s Big Mouth. The beer pours a dark golden colour with a white head, which dissipated quickly. I do sense citrus in the aroma which I love. There is a nice bitterness to this beer throughout and in the finish. I was wondering if this would be a safer more mainstream beer but it isn't. It is a true pale ale with that nice bitter finish. This is a beer that I would buy and bring home again or order up on tap. After tasting this one, I hope they John and Kevin embark on an IPA journey! I love Happy Hour and I've been wondering why some places that carried stopped carrying it! I guess it was the name. Now I will look out for both!